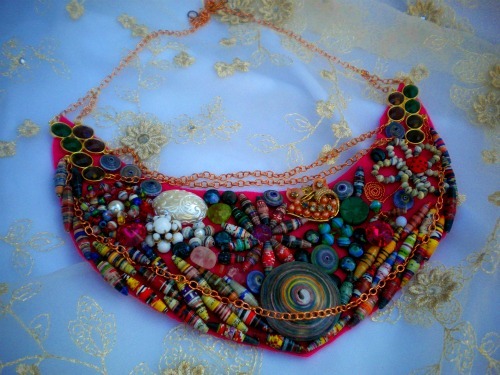 I always admire when I see a beaded bib worn as a necklace or attached to a neckline of a top. It is a fun project, the kind that somehow surprises you with what the outcome would be. I gathered, old trinkets, buttons, mismatch earrings, some beads and paper beads of course and proceeded to put together my own version of the beaded bib. How to: Cut out a pattern from a felt of any color to fit your neckline. 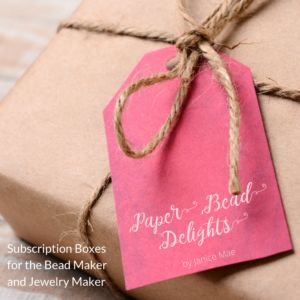 Gather beads, buttons, ribbons, etc….and lay them out on your pattern. I used E6000 to glue the big pieces, if you want to put seed beads into the mixture it’s better to sew it onto your piece. I don’t consider this a quick project because it involved laying out your beads and finding the right placement. After………it will be all worth it! 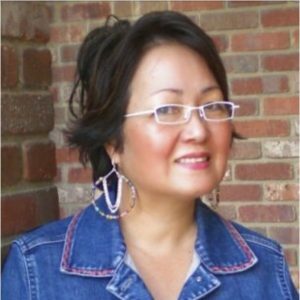 Hello Janice, would like to wish you a very Happy and Prosperous New Year!and also to everyone who posts their comments here at your blog site too. I love the beaded bib i think its a fabulous way to use paper beads and yours here really does make a very pretty statement.sincerely Diane beading away happily. What a way to bring in the New Year! I agree with Manou very awesome necklace. wow!! what a beautiful project! 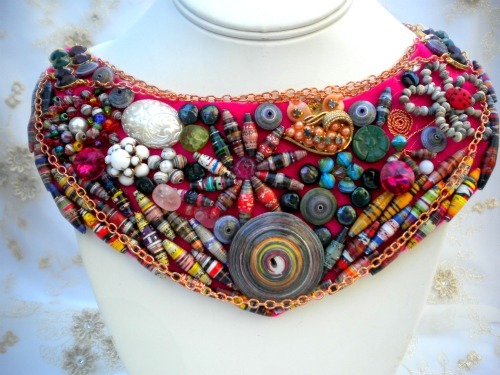 this necklace is awesome ….. How nice way to use mismatched beads or anything else you love! so beautiful ….. I take this opportunity to wish you and your family a very happy Christmas and New year!